G Kurupasamy, a 37-year-old resident of Irunjirai village in Virudhnagar district of Tamil Nadu, looks forlorn. He wants water for his fields, but hasn't got any help from the government. Though the village tank, a traditional waterbody, was restored by March 2006 by the public works department (pwd), there's not even a drop of water in it. "Restoring the tank for the heck of it, as is done by the pwd, is of no use. Rather, they should get an irrigation channel to our village," says Kurupasamy. The Irunjirai tank was restored at a cost of about Rs 95 lakh. The work mainly involved standardising the bund (or, restoring the tank's boundary wall) and converting the earthen channels of sluices into concrete ones. "What's the point of spending so much on a tank in which water has not collected for the past 15 years. The main problem is that its catchment area has been encroached upon, and nothing has been done about it," says Krishnan, another resident of the village that lies in Tiruchuli taluk. Similar refrains of villagers' misery and mismanagement on the part of pwd can be heard in many other parts of Tamil Nadu. For instance, the Tiruchuli tank (which benefits three villages), restored more than 10 years ago, is today overgrown with Prosopis juliflora. Asked why maintenance was not given priority, A Palanisamy, assistant engineer, pwd, Madurai, says, "Our jurisdiction ends at the bund area of the tank; the water spread area (where water collects) is under the revenue department. It will have to wait till the girth of P juliflora is two inches (about five cm) to request the forest department to do an assessment. Only after the assessment would the revenue department take a decision about removing P juliflora." How much time will all that take, is anybody's guess. These are not the only flaws in the government approach to tank restoration on which crores of rupees have been spent. "Villagers -- who have maximum knowledge about their respective tanks -- are mostly ignored by pwd officials while restoring tanks. Water users associations -- whose members are said to be responsible for distributing the tank water -- have beenformed for namesake, as it was stipulated by international donor agencies. In reality, these associations have not been entrusted with any powers," says P Gomathinayagam, a member of the Institution of Engineers, who has assessed several tanks in the state. Four functions In Tamil Nadu, tanks are classified into three types: panchayat tanks, pwd tanks and system tanks. The pwd tanks are those with a command area of 40 hectares (ha) or more. If a tank is less than 40 ha but gets supplementary supply from a reservoir, then too it is considered a pwd tank, and is called a system tank. All the remaining tanks are under panchayats. An indispensable part of the village, tanks are supposed to fulfil four functions -- water conservation, soil conservation, flood control and protection of ecology in the surrounding area. But over the years, many tank systems have lost their utility primarily due to lack of maintenance and management. To restore the tanks, the main tasks that need to be undertaken are desilting, repairing and broadening (if required) of the surplus weir (portion of the tank to drain excess water), sluice outlet maintenance, and, most importantly, clearing up the feeder channel. 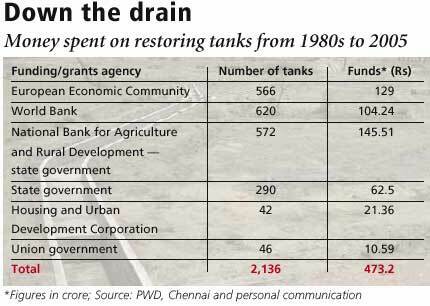 But experts say that most of the money spent on restoring tanks is as good as wasted because of a lopsided approach by the government (see table: Down the drain).
" pwd only concentrates on repairing and broadening of the surplus weir and sluice outlet maintenance as it is easy to make money on such masonry work," says C R Shanmugham, programme officer with Dhan Foundation, which has done extensive tank restoration work in south India. Therefore, the main problems -- silting and choking of the feeder channels -- persist. "During an evaluation of the pwd programme, local people were asked about how many times their tanks had suffered a breach. Many answered never. Then why does the pwd ignore this information and spend crores of rupees repairing/broadening the surplus weir?" asks R Venkatasamy, programme officer, Dhan Foundation. "No tank-specific planning had been done, which is crucial. Furthermore, they (pwd) don't do desilting of tank, which affects the water retention capacity of the tanks. Only silt required for standardisation of bund is taken out," he adds. Counters Palanisamy, "De-silting is not our priority area. Where do we dump the silt?" According to Gomathinayagam, there is no point in reviving a tank if the feeder channel is blocked, which is the case with many tanks. "Politically strong people encroach the inlets and nothing is done about them," he says. Besides, as most tanks are inter-linked, encroachment on the feeder channel of one tank affects several others. "The revenue department has to remove the encroachments. However, it is not very cooperative, as it has political linkages," says N Kailasapathy, deputy chief engineer, design research and construction, pwd, Chennai. Farmers believe that cleaning the feeder channel should be the first priority, according to a study conducted in 2005 in Tamil Nadu to evaluate tank restoration. Other tasks in decreasing order of importance should be tank de-silting, tank bund improvement, sluice repairs, repairs of surplus weir and cleaning the surplus course, found the study that was carried out by a partnership between the Sri-Lanka based International Water Management Institute and the Sir Ratan Tata Trust, Mumbai. The pwd, however, pays no heed to such findings while restoring the tanks. The study said that to achieve sustainable management of tanks, institutional sustainability and the sustainability of physical works should be ensured. If livelihood options for the poor are also provided in restoration work undertaken, people would show more interest in the upkeep of tank system, it added. This fact again has been ignored by pwd. Most restoration work is done through contractors, with the villagers and their knowledge completely ignored. Non-involvement of farmers is the major lacuna in the planning process, according to a 1992 report of the Centre for Water Resources (cwr), Anna University, Chennai, on tank modernisation (Phase 1) with European assistance. Even when farmers are consulted, their views are largely ignored, says the report. Ironically, the National Bank for Agriculture and Rural Development (nabard), which is granting loans to the state government for tank restoration, does not think involving farmers will be beneficial. "The moment you put money into it, things become complicated. Even if there is a water users association, who would become responsible for the money?" asks B Shridhar, project manger, nabard. pwd officials say they prefer contractors. "There is efficiency in work if contractors are involved," says R V S Vijayakumar, chief engineer, pwd, Madurai. "Farmers are not capable of restoring the tanks, and if huge amounts of money are handed over to them then the chances of corruption are very high," says Palanisamy. Experts, however, disagree. "If farmers can construct their houses and other structures in the villages, then why can't they restore their tanks? They only need to be guided on the technical aspects by government engineers," asserts Gomathinayagam. The officials have their reasons and the pwd the resources, but the government hasn't got the experience of working with communities and Kurupasamy doesn't have water for his fields. If tanks are not restored in the next 10 years, warns Gomathinayagam, the generation of farmers familiar with their use may no longer be around to pass down their knowledge. Underlining the need for a strategic alliance between officials and ngo s on restoring tanks, M P Vasimalai of Dhan Foundation says, "The government needs to shift its role from implementator to facilitator." That will be especially important because pwd now plans to spend another Rs 4,000 crore on restoring the remaining tanks. Let's hope that this huge sum does not flow down the drain.